The Ochsner LSU Health System of North Louisiana has named the 10 individuals comprising the joint venture’s board of directors. The role of the board is to represent Ochsner LSU Health Shreveport stakeholders and manage the business affairs of the partnership organization. · Steve Skrivanos, owner of Skrivanos Engineering Inc.
· Dr. Carolyn Hunt, executive director, Louisiana wCenter Against Poverty Inc. Goodwill Industries of North Louisiana announces the addition of Lynn Stevens as the director of workforce development. Stevens will develop, implement, administer and direct all activities related to workforce development practices, outreach initiatives and programs, such as employment services and vocational evaluation. Stevens will also oversee the development and administration of rehabilitative services, training and employment placement services that enable disabled and/or disadvantaged clients to achieve their maximum independence. Stevens comes to Goodwill Industries from the United Way of Northwest Louisiana, where she worked as the chief operating officer for more than eight years. While there, Stevens was instrumental in developing, implementing and expanding many of United Way’s community impact efforts, including the re-engagement of the 2-1-1 Helpline. Stevens has raised more than $30 million for NWLA nonprofit organizations and has been recognized over the years with multiple awards, including the Clarke’s Jewelers “Good Works” Awardee, Association of Fundraising Professionals Fundraising Executive of the Year, Bossier City Chamber of Commerce “Scott Croft” Spirit Award, Athena Award Recognition, SB Magazine’s Women in Business Recognition and Quota International’s District 21 All Star Award. Bossier City Mayor Lorenz Walker recently signed a proclamation dedicating a day in April for her service to the community. The David and Teresa Disiere Foundation has pledged $50,000 to help Shriners Hospital for Children – Shreveport build a new patient-friendly playground. The couple presented the hospital with a check for $25,000 and promised to match up to $25,000 in additional donations. The pledge is in honor of David’s late father, Mr. Francis Disiere, who was a longtime member of the El Karubah Shriners of Shreveport. The playground will be named in honor of Francis Disiere. This donation kicks off a fundraising campaign to raise $175,000 needed to equip and install the specially designed playground. The playground will be accessible to all Shreveport Shriners Hospital patients, with the layout and equipment designed to accommodate children who rely on aids such as walkers or wheelchairs. The area will also be used by the hospital’s physical therapy team to help patients with their rehabilitation. 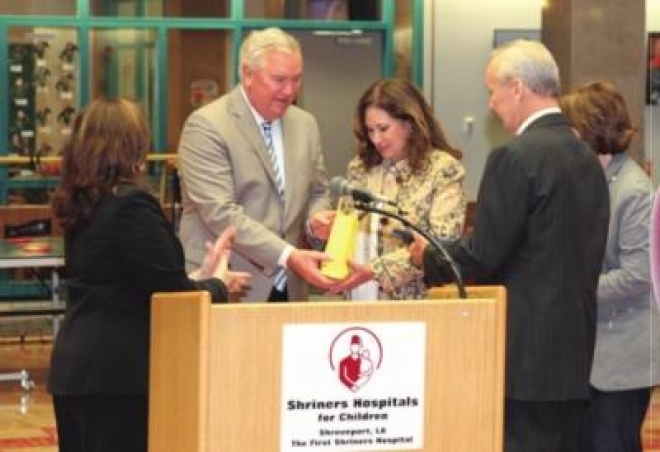 The David and Teresa Disiere Foundation made a similar pledge last year that helped the Shreveport Shriners Hospital purchase a new EOS X-ray system, which exposes patients to less radiation than standard X-ray imaging. The equipment is of particular benefit to children who may require numerous X-rays over the course of their treatment. Members of the public who wish to support the playground initiative at the Shreveport Shriners Hospital can do so by calling 318-226-4272. LSU Health Shreveport Chancellor, and chairman and professor of oral & maxillofacial surgery, G.E. Ghali, DDS, MD, FACS, FRCS(Ed), has been elected to the American College of Surgeons’ Board of Governors as a Specialty Society Governor. Dr. Ghali will serve as the representative for the American Association of Oral and Maxillofacial Surgeons (AAOMS) and will serve a three-year term in this role. Specialty Society Governors serve as a direct communications link between the Fellows of the College and the members of the Board of Governors. The ACS is a scientific and educational association of surgeons with the mission to improve the quality of care for patients by setting high standards for surgical education and practice. Dr. Ghali was named an American College of Surgeons Fellow (FACS) in 1998. WK Eye Institute surgeons Christopher Shelby, MD, and Wyche T. Coleman, III, are the first surgeons in Louisiana to perform the Zeiss ReLEx® SMILE® vision correction procedure on patients with astigmatism. This fall the U.S. Food and Drug Administration announced approval of SMILE for patients who are nearsighted and have astigmatism, clearing the way for Willis-Knighton surgeons to begin offering this vision correction to a larger audience this month. The SMILE technology, often referred to as “the next generation of LASIK,” was first introduced in Louisiana by Drs. Shelby and Coleman. They have performed SMILE since April 2017. During the minimally invasive procedure the surgeon uses the VisuMax® femtosecond laser to create a thin, disc-shaped lenticule (disc of corneal material), which is extracted through a small incision on the surface of the cornea. This adjusts the curvature of the eye, correcting the vision. Focusing on technological advancements in eye care, Drs. Coleman and Shelby were the first surgeons in Louisiana to use the VisuMax femtosecond laser. Willie-Knighton eye surgeons remain the only ones in this area who are trained to use this technology. To date, more than 1.5 million SMILE treatments have been performed worldwide. More information on this procedure is available at from the WK Eye Institute’s Refractive Surgery Center by calling (318) 212-2015 or visiting wkeyeinstitute.com. The state’s first Eluvia drug-eluting stent was implanted by William B. Eaves II, MD, interventional cardiologist with Willis-Knighton Cardiology, on Friday, Oct. 12. The procedure was performed at Willis-Knighton Heart & Vascular Institute’s cath lab at WK Bossier Health Center. The Eluvia drug-eluting stent is a new treatment option for patients suffering from peripheral artery disease (PAD). PAD occurs when plaque builds up in the walls of the arteries, making them narrower, thus restricting blood flow. When this occurs, the muscles in the legs cannot get enough blood and oxygen, especially during exertion such as exercise and walking. As the disease progresses, plaque accumulation may significantly reduce blood flow through the arteries, resulting in pain and increasing disability with severe cases often leading to amputation of the affected limb. It is estimated that 8.5 million Americans over age 40 are affected by peripheral artery disease. The drug-eluting stent is designed to restore blood flow in the peripheral arteries above the knee, including the superficial femoral artery and proximal popliteal artery. It features a unique drug-polymer combination intended to facilitate sustained release of the drug (paclitaxel) that can prevent narrowing of the vessel. The polymer-based drug delivery on the Eluvia stent has proven biocompatibility and safety. I HAS been implanted in more than 20 million vessels with more than 100,000 patients studied in clinical trials. When caught early PAD may be treated with medications, diet, exercise and smoking cessation.